There could be no more fitting winner in the final race of the season at Albury on Tuesday than that of Ilovethislady. The mare is trained at Albury by Donna Scott whose father Graham Hulm has been battling some recent heath issues and until recently prepared Ilovethislady. Ilovethislady, who has a win and a second from two previous first-up starts, resumes in the final race on the seven event program. Scott only has Ilovethislady racing at present with stable mainstay, Florelle, recently transferred to Brett Dobson at Coffs Harbour where he will race on Thursday. 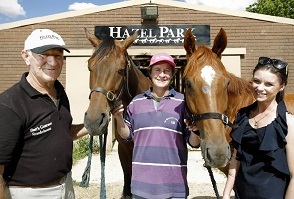 “Florelle was my first starter back as a trainer after about six years without a runner,” Scott said. “He had a few starts for me and now Ilovethislady is ready to race plus I have a few others in work including Lord Von Costa who is a half-brother to Ilovethislady. Graeme Hulm, Donna Scott & Danielle Scott. Credit: Ben Eyles - The Border Mail. Ilovethislady has had one trial to prepare her for Tuesday and did win first-up at Echuca in March. The four-year-old will be ridden by Nikita Beriman who was aboard in her final two runs last preparation. Ilovethislady is a daughter of Cashed Up Lady who was also trained by Scott. “I hope she can go on a bit and prove good enough to win a midweek race or one of the Highway races in Sydney,” she said. Ilovethislady will oppose a fairly strong field with last start winner Pacific Tycoon one of the main dangers. Pacific Tycoon recorded an overdue win last start at Albury after a run of consistent displays. “He ran fourth, third, second then won and hopefully he can win again,” his trainer Jodie Bohr said. The final meeting of the season will also decide the jockeys’ premierships for the Southern District Racing Association and also at Albury. Wodonga jockey Nick Souquet is in contention to win both titles and presently only narrowly trails Nick Heywood (SDRA) and Richard Bensley (Albury). View the fields and form (including race replays) for Tuesday's Albury meeting here.